Contrary to what you may believe, it is possible to put anything on a pizza. 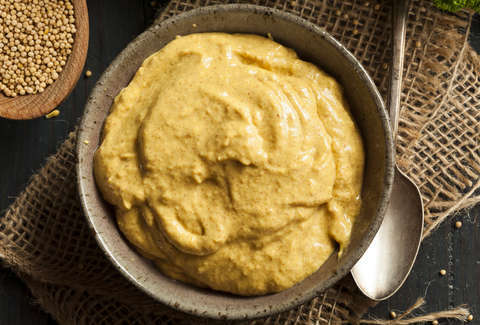 You'll call it sacrilege, blasphemy, a desecration, and affront to everything you hold dear about pizza, but dressing it in mustard isn't an offense punishable under the law. So you're going to have to deal with the fact that stuff like this happens occasionally. Thanks to the NYC pizzeria Lions & Tigers & Squares, the internet has renewed reason to scream at each other because of pizza. On Twitter, Insider highlighted one of the restaurant's pies, which substitutes tomato sauce with mustard. Predictably, everyone with nothing better to do decided to flood Insider's mentions, posting multiple pleas to call the cops on such an outrageous culinary travesty. You'll notice the Detroit-style pizza is made with spicy mustard, corned beef, and brick cheese, fashioning it after a Rueben sandwich. It's actually a pretty interesting concept, if you're a fan of the perennially-satisfying Reuben. Still, that didn't stop critics from crying out about it. In Sicily, this is punishable by stoning. Now will y’all stop hating on pinapple pizza..